North Pole Apt w/Porch - Near Santa Claus House! Property 8: North Pole Apt w/Porch - Near Santa Claus House! An Alaskan cabin experience awaits you in this classic 60's log home! Property 11: An Alaskan cabin experience awaits you in this classic 60's log home! 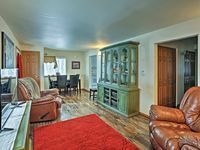 Cozy two bedroom log cabin on the Chena River near town. Property 12: Cozy two bedroom log cabin on the Chena River near town. Serene Fairbanks Cottage w/Garden on Chena River! Property 13: Serene Fairbanks Cottage w/Garden on Chena River! Property 14: Arctic Dream - Spectacular view of the city and the aurora! New Listing! Heartland Ranch Studio on 38 acres! Cozy Fireplace! Walk to River! Property 16: New Listing! Heartland Ranch Studio on 38 acres! Cozy Fireplace! Walk to River! Comfortable House With Kitchen On The Chena River. Family Friendly. Property 19: Comfortable House With Kitchen On The Chena River. Family Friendly. New-Heartland Ranch on 38 acres-Walk to River-Cozy Fireplace! Property 20: New-Heartland Ranch on 38 acres-Walk to River-Cozy Fireplace! 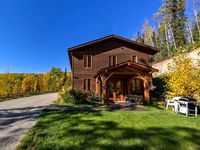 Property 21: Hike, Kayak, Bike and Ski near the Chena River PERFECT for long-term guests! Spacious yet Cozy Home conveniently located in Fairbanks w/ Ample Amenities! Property 22: Spacious yet Cozy Home conveniently located in Fairbanks w/ Ample Amenities! Apartment in Great Fairbanks Location Near Dining! Property 28: Apartment in Great Fairbanks Location Near Dining! 'Lizzie's Nest' Fairbanks Studio w/Cozy Fireplace! Property 29: 'Lizzie's Nest' Fairbanks Studio w/Cozy Fireplace! Spacious 6 bedroom, 4 bathroom, luxury and affordable. Amazing aurora viewing. Property 40: Spacious 6 bedroom, 4 bathroom, luxury and affordable. Amazing aurora viewing. Executive Suite 3 Bedroom, 2500 Sq Ft.
Property 46: Executive Suite 3 Bedroom, 2500 Sq Ft.
We had a wonderful time visiting our son who is in the AF in Eielson! The home was cozy and perfect everything we needed. It was also in a perfect location between Fairbanks and Eielson AFB. It was nice to have all the comforts of home with full kitchen and washer and dryer etc...we definitely would recommend for others to stay...thank you!! Home away from home.. a place worth coming back to while in Fairbanks..
We are a big group of family and friends who stayed at Knoll House for 3 nights in March 2019. We are all from Anchorage and staying at Knoll House made us feel the warmth and safety of our own homes. From our arrival to departure from this place, everything was easy and smooth. We arrived earlier than the check in time and Mr.Norman was so gracious to allow us for early check in. He even came to see us a couple of times to check if we were okay. His personal attention and friendly, welcoming gesture is much appreciated. The house is spacious with its 4 big rooms; each having its own bathroom was a big plus factor esp if sharing the home with other family friends. It allows individual/family privacy and at the same time the common areas (living rm/dining rm etc) provide a comfortable place for bonding, camaraderie and fellowship among us. There is nothing that we needed that wasn't available in the house. It was prepared to make anybody staying in the house comfortable. From the antique displays to the comfortable linens/quilts to the new kitchen paraphernalia, everything was admirable. The place is very accessible to both downtown Fairbanks and even to Chena Hot Spring resort. Knoll house is a place worth going back to; truly a home away from home. We will for sure go back again and let our friends know so they can also experience the same warmth and safety that we had while staying in this place. Thank you, Mr. Norman for sharing your beautiful home to us.